Free GM Resource: Swords & Wizardry +Several Other Downloads from Frog God Games. Last week while I was working on that NPC race for an upcoming adventure I decided I wanted to stat it out for a game system, but I wanted something that would be a bit on the "OSR Generic" side of things. 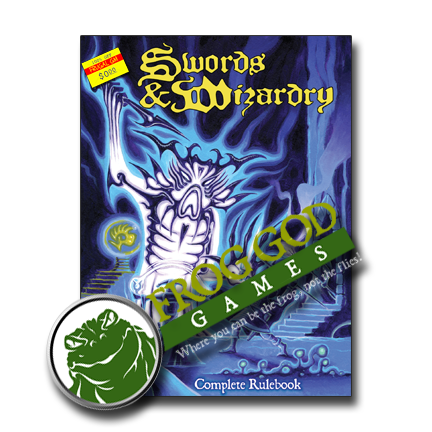 I ended up using Swords & Wizardry, which is available for absolutely free in a couple of places, but notably on the Frog God Games download page. It is up there with a couple of other items that you may or may not be interested in as well. I've already recommended A Quick Primer for Old School Gaming, but there are four other downloads to check out. Two are coloring books and the other two are adventures. ...if anyone has already used that as such a resource, please let me know.